Corn chips with melted cheese, salsa, sour cream and guacamole. $11.00 Our Famous Buffalo Wings: not for the faint hearted! Try our famous all american buffalo wings. Choose from our homemade mild, hot or EXTREME chili sauce. Served with a blue cheese dressing. Served with tomato sauce Load 'em up with cheese & bacon for $2 each! With Sweet Chili and Sour Cream. Load 'em up with cheese & bacon for $2 each! Spicy potato wedges topped with salsa and sour cream. Load 'em up with cheese & bacon for $2 each! Freshly diced tomato, red onion, fetta & fresh basil with a drizzle of balsamic reduction on toasted ciabatta. Two warm ciabatta rolls filled with garlic butter & topped with melted cheese. Featuring, minute steak, chicken tenderloins, chorizo sausage, pork cutlet, crispy bacon, grilled mushrooms with a side of chips, fried egg and tomato served on a platter with gravy. MGF = Modified Gluten Free- this meal can be made Gluten Free with a couple of changes, see our friendly staff at the bar for details. Fresh crumbed chicken breast served with chips, salad and gravy. Crumbed chicken breast schnitzel topped with home made napoli sauce, ham and topped with melted cheese served with chips and your choice of Garden Salad, Hoops Potato Salad or Seasonal Vegetables. 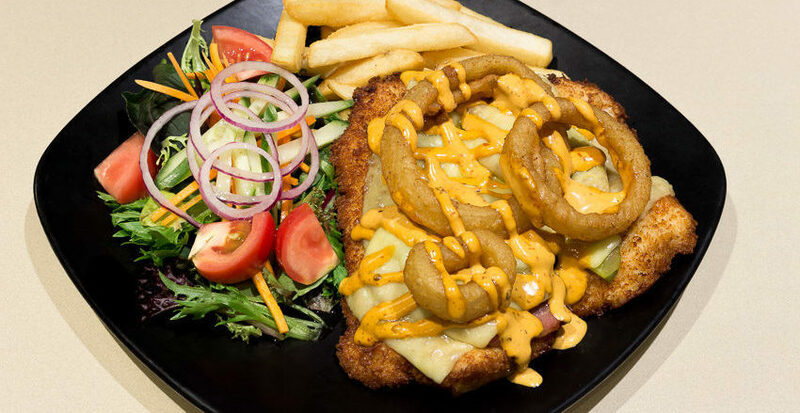 Crumbed chicken breast schnitzel topped with home made napoli sauce, ham, BBQ beef strips, mild salami topped with melted cheese served with your choice of Garden Salad, Hoops Potato Salad or Seasonal Vegetables. Crumbed chicken breast schnitzel topped with mild salsa sauce, spicy beef mince, topped with melted cheese served with chips and your choice of Garden Salad, Hoops Potato Salad or Seasonal Vegetables. Slow cooked pork shoulder covered in a home made spicy rub with BBQ sauce and coleslaw served with wedges and sour cream. Crumbed chicken schnitzel topped with ketchup, pickles, swiss cheese, bacon & onion rings complimented by our zingy house made chipotle mayo. Served with your choice of Garden Salad, Hoops Potato Salad or Seasonal Vegetables. Slow cooked American style pork ribs covered in a house made Kentucky sauce flavoured with Canadian Club whisky. Served with chips & garden salad. House crumbed chicken schnitzel topped with beef mince, bacon, red onion, BBQ sauce & finished with American cheese. 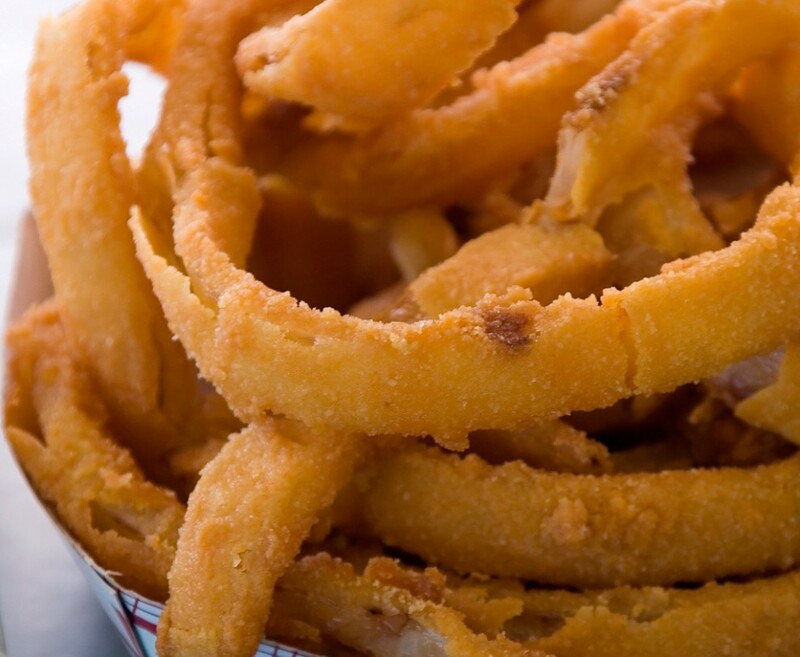 Served with chips & your choice of garden Salad or Hoops potato salad. House made beef patty topped with bacon, pineapple, egg, Swiss cheese with tomato sauce, lettuce, tomato & onion. Served with chips. House made beef patty topped with bacon, pickles, Swiss cheese, deep fried onion rings, lettuce & drizzled with house made chipotle mayo. Served with chips. Home made lemon tart with chantilly cream. Rich fluffy chocolate mousse topped with freshly whipped cream and strawberry.